To say that Dave Mustaine is legendary would be an understatement. One of the all time greatest lead guitarists/vocalists in the thrash metal, heavy metal and speed metal genres, Mustaine's signature fast-paced style is as unique and complex as the man himself. An original lead guitarist for Metallica, Mustaine is the lead guitarist, vocalist and founder of Megadeth, a hugely successful band that continues to pack stadiums around the world. 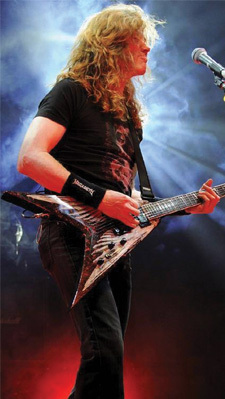 Mustaine is not only established as one of heavy metal's leading figures, he is well known for his quick wit and biting quotes and commentaries. His book Mustaine: A Heavy Metal Memoir is on the New York Times Best Seller list, and Megadeth's American Carnage tour with Slayer and Anthrax is selling out shows throughout the U.S. and Canada.
" Mogami cable is durable and flexible enough to practically build a suspension bridge with but I'll settle for using it for my guitars and amps! "